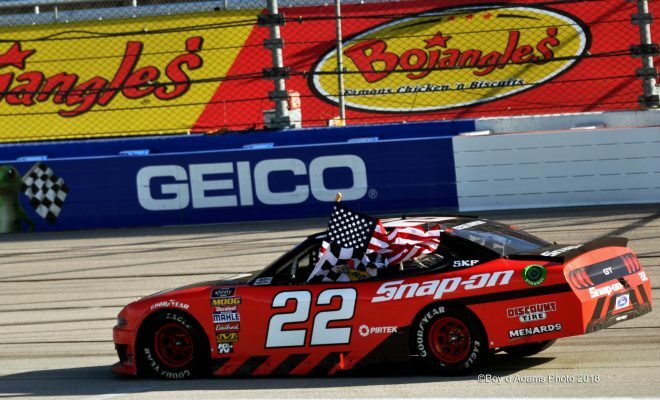 DARLINGTON, S.C. — Brad Keselowski won the Sports Clips Haircuts VFW 200 for his first victory at Darlington Raceway. On a lap 117 restart, following a wreck between Ross Chastain and Kevin Harvick, Custer was alongside Keselowski but couldn’t stay with him. Though Custer maintained his second place track position he never made up the distance lost on the eventual race winner. “For some reason I can’t get going on restarts. 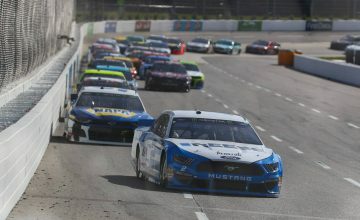 I just spin the tires, so I don’t know if that’s something we can do transmission-wise, or I just need to work on something,” Custer mused after the race. 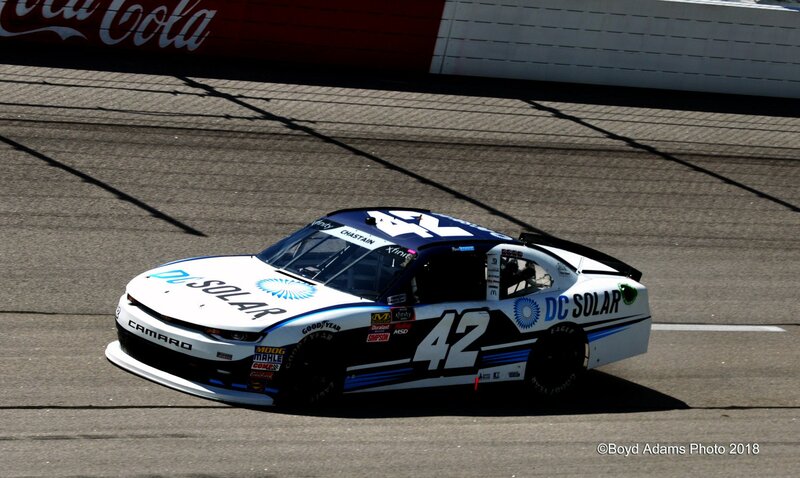 Chastain won both the first and second stage in his debut race with Chip Ganassi Racing. 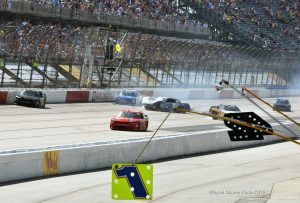 When the race restarted for the third and final stage Chastain was tasked with holding off Brad Keselowski. On the restart, he cleared the 2012 Monster Energy NASCAR Cup series champion but Keselowski didn’t back off. After giving Chastain a full rearview mirror, Keselowski tried a move to the inside through turns three and four — he didn’t clear him. By the time they returned to turn-one Chastain had a car length lead. 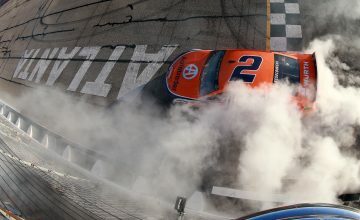 A few laps later, Keselowski drove deep into turn-three, passing Chastain but without enough grip he slid into the outside wall. Bouncing off it he lost momentum, allowing Chastain to cross over his tracks and pass him to the inside. Kevin Harvick, who had been watching the pair battle, passed Keselowski too. Ross Chastain wheels the No.42 DC Solar Chevy for Chip Ganassi Racing. Photo by Boyd Adams. Now it was Harvick’s turn. Coming into thickets of lapped traffic, Chastain rode the outside line and weaved around the slow cars. He used lapped traffic as a pick down the front straightaway, but in turns one and two a lapped car was running his line. Harvick dove under him, as the pair drove past the lapped car Harvick nudged up into Chastain’s left-side. The contact continued, Chastain was pushed into the wall. When he slapped the wall Chastain went back down the track and hooked Harvick in his right-rear quarter panel. Harvick’s No. 98 Ford Mustang was rendered uncompetitive. Angry, Harvick drove to pit road and parked his car in Chastain’s pit stall. After a few moments of upset gestures, Harvick was told to move along by a NASCAR official. Harvick took his car to the garage and was then, because he was involved in a wreck, was taken to the infield care center. Chastain went on to race the rest of the event but with a track-bar issue he finished two laps down in 25th. He said, “once we hit the wall, man, I was out of control,” disagreeing with Harvick’s insinuation. 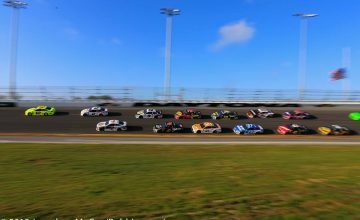 Racing into the third lap of the event, Austin Cindric was tagged in the left-rear by Ryan Truex on the exit of turn-four. Skidding across the front stretch, Cindric shunted the inside retaining wall. The wreck marked an early end to his final race of the year in Roush Fenway Racing’s No. 60 NASCAR Xfinity Series car. “My only mindset coming in today was to learn 200 miles around Darlington. That’s all I cared about,” said Cindric. This is the fourth time Cindric has registered a DNF for the team. He shares the ride with Chase Briscoe and Ty Majeski. Austin Cindric rolls across the front stretch after colliding with the inside SAFER barrier. Photo by Jonathan McCoy.